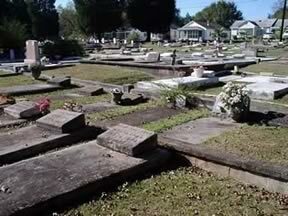 Located on Martin Luther King Dr.
For an overview map of the entire cemetery, click bone.gif. Bone Cemetery is named for Russell G. Bone, who began the cemetery in approximately 1940, when it was determined that Milledgeville needed an African American cemetery. The Bone family sold the lots until all were sold. The cemetery is now entirely sold out and in the hands of private individuals. There are approximately 1750 graves in the cemetery. The city currently mows and generally maintains the cemetery. Georgia, PVT, 42 SIG Constr. Bn. Georgia Pvt, 555 Parachute Inf. 1st name very difficult to read. Adult sized slab. Death date nearly unreadable - may not be Feb 24. Written as "Lena/BellFreeman" on slab. Room for a grave, but no grave visible. Grave being buried under tree. Mother at Rest Last named spelled Harrson. Last name may be misspelled and is probably Harrison. On same gravestone as Mary Julia Reaves. On same gravestone as Jessie Reaves. 6 ft by 6 ft cement block that may or may not have graves beneath it. Continuation from row D lot 8. Slab sinking. Last name hard to read. Grave begins a new lot. Lot joined with row D, lot 12. On same headstone as Seaborn Landrum. On same headstone as Mattie Landrum. Husband Begins a new lot. Gravestone facing at right angle from normal position. Grave is quite sunken. Grave begins a new lot. Lot continues to row B, lot 12. New grave as of Nov. 1, 2003. No marker or slab - Section marked "The Hills." In section marked "The Hills." Adult slab in section marked "Austin." Alonza West Wets [sic. ], Sr.
Name not shown as West. Gravestone assumed to be misspelled as Wets. On same gravestone as Ollie James Sanford. On same gravestone as Joseph Sanford. Mattie Davis has an older 2nd marker resting at the side of the coping. Deacon Begins a new lot. Persons 3 & 4 are enclosed in coping with 2 "Morris" graves. Child-sized slab below Willis C. Washington. A Tender Mother and A Faithful Friend Her last name is engraved as Washington-Albury. Picture of dog on headstone. Last name not clear and could be read as F. Avors. Large rock at foot of grave. Starts a new lot. Potential grave. "Bill" on line underneath Willie Brown. Assumed to be nickname.